For our recent trip to Oklahoma, my mother-in-law, Denise, made a batch of “Caramel Puffs.” These are basically like caramel corn except you use corn puffs instead of popcorn. So yes, this is basically sugar on air – yum! These didn’t last long with our group; I was lucky to be able to snap a photo before the bowl was emptied. All that crunchy, sweet, and salty goodness. Butter two large pans. Spread corn puffs evenly on pans. In a large saucepan, mix butter, syrup and brown sugar. Bring to a boil; boil for 2 mins. stirring constantly. Remove pan from heat. Add 1 tsp baking soda. Mixture will froth up. 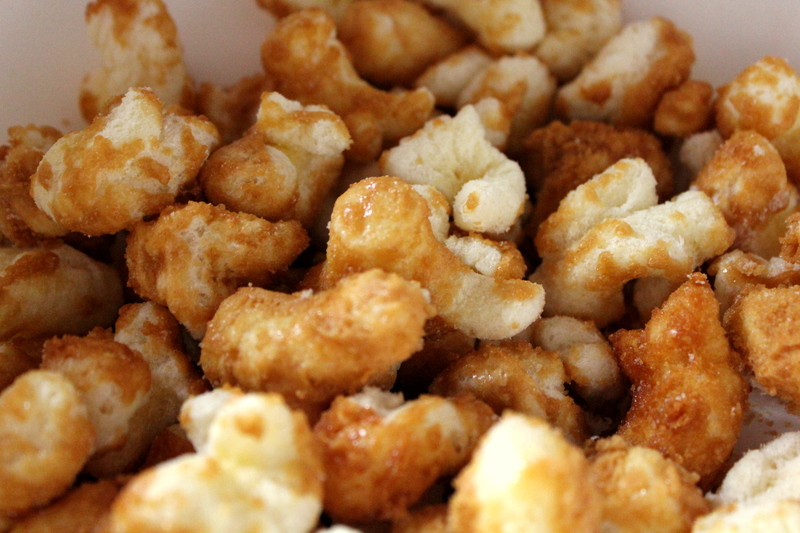 Pour over corn puffs. Stir to coat. Bake in 250 degrees for 45 minutes, stirring every 15 minutes. Spread onto wax paper to cool. While in Oklahoma with the extended family, we took turns cooking dinner each night. My sister- and brother-in-law grilled burgers and introduced us to Allegro marinade. This stuff is good! I picked some up as soon as we got home and planned to do an Asian-inspired summer cookout. The Hot and Spicy marinade’s ingredients are basically soy sauce, lime juice, garlic and red pepper – perfect for an Asian burger. Main dish done. The side dish made me think for a while. There are several recipes for Asian coleslaws, but I wanted something new to try. We picked up some cucumbers at the Farmer’s Market, and my sister gave me a recipe for Sesame Cucumber Salad. Side dish done. 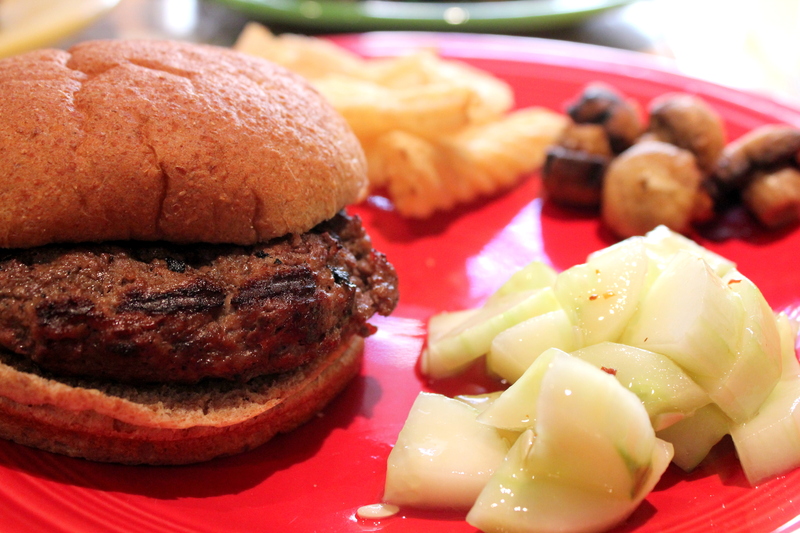 The burgers were spicy and juicy, and the cucumber salad was cold, crisp and tangy. Serious yum. Brett also grilled some mushroom skewers, and we added some kettle-cooked chips because they’re just really good. He pronounced these his favorite cucumbers ever. We enjoyed mixing Asian flavors with American cookout staples for this tasty summer meal. Closets are scary. I open the door, see all the stuff, freak out, then close the door and try to forget what I saw. 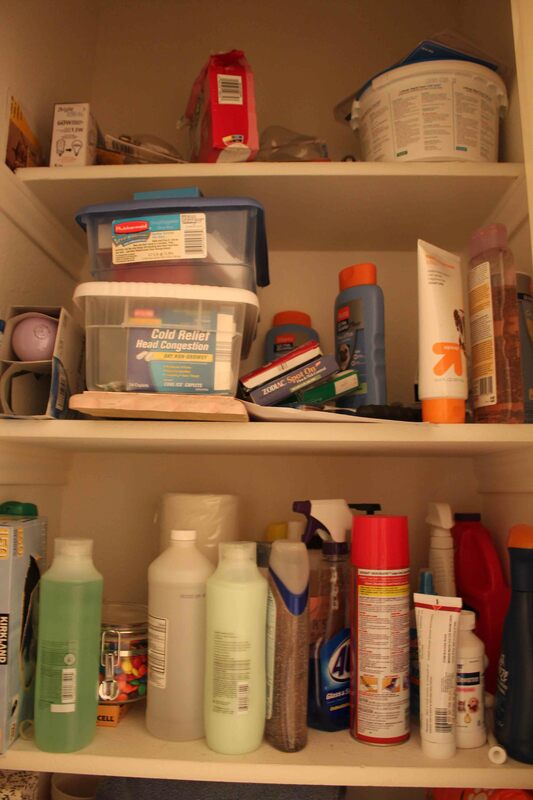 The closet in our front bathroom has been bad for a while. 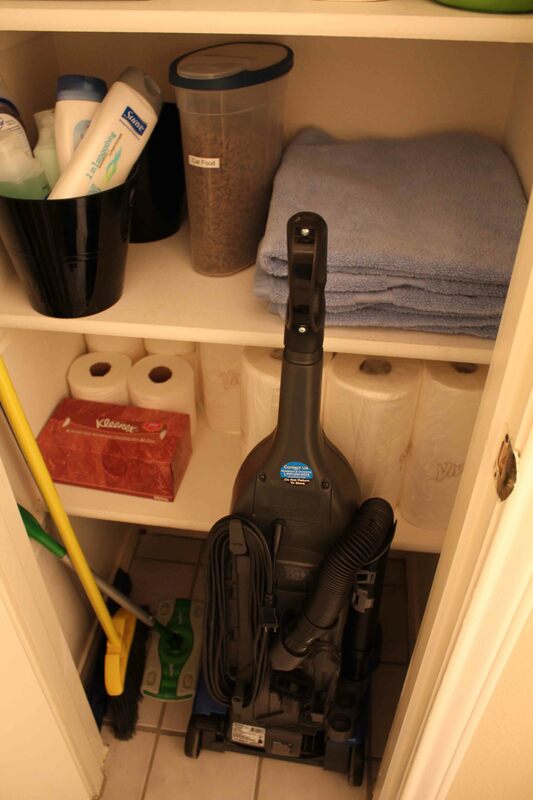 Recently, I decided this would be a convenient place to store the vacuum cleaner. But there was no way it would fit in there. So while Hannah napped today, Brett and I tackled the closet. 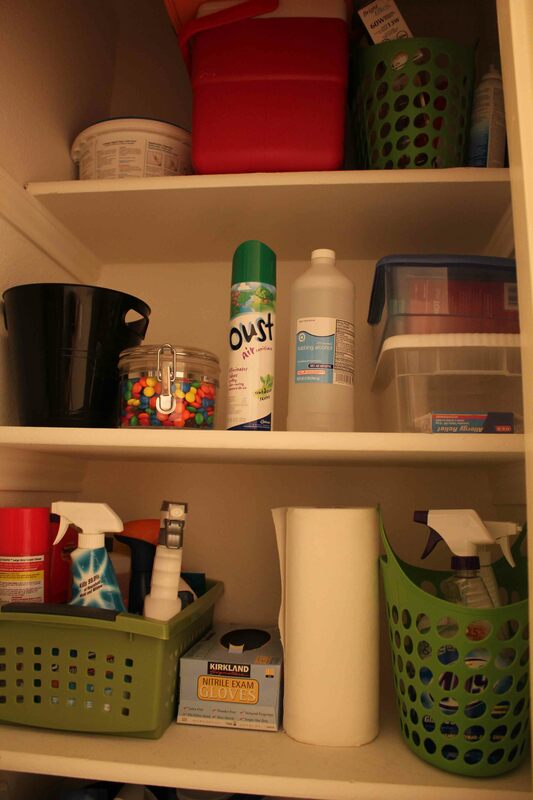 I got six small buckets and plastic baskets to help with organization – totaled only $8 at Target. 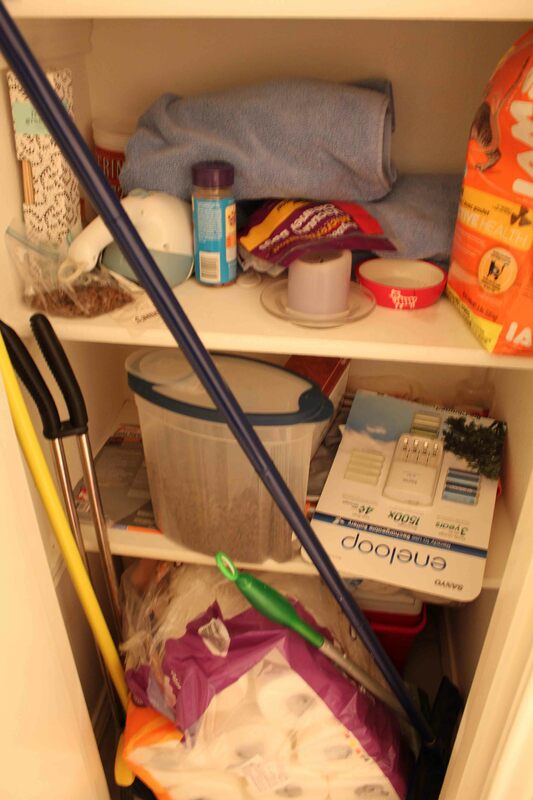 We moved some items to better places, threw some out and were left with plenty of room for the vacuum cleaner. Mission accomplished! This is a surprising combination, but really good! My Grandma Ava shared that she likes to mix about a cup of grated zucchini in with brownie batter and gets lots of compliments. This makes brownies a health food, right? And talk about easy and affordable – a brownie mix and a zucchini don’t break the clock or the bank. Zucchini Chocolate Rum Cake – intriguing! Yesterday we broke a record for consecutive days of triple-digit heat – 70 days! Then today we got a break. This afternoon, I heard a weird noise – it was rain! Very short, but we’re thankful for anything after months without. And we didn’t even hit 100. We broke the record then got a break. The forecast is for more high temps for the next weeks, but maybe we’ll get another respite. It’s been a brutal summer. So I’m posting this picture to remind myself that it occasionally gets cold in Austin. And someday we might have more relief. Though it’s extra-depressing that this picture was taken in February, and our “yard” is greener than it is now. Big day for a big girl! 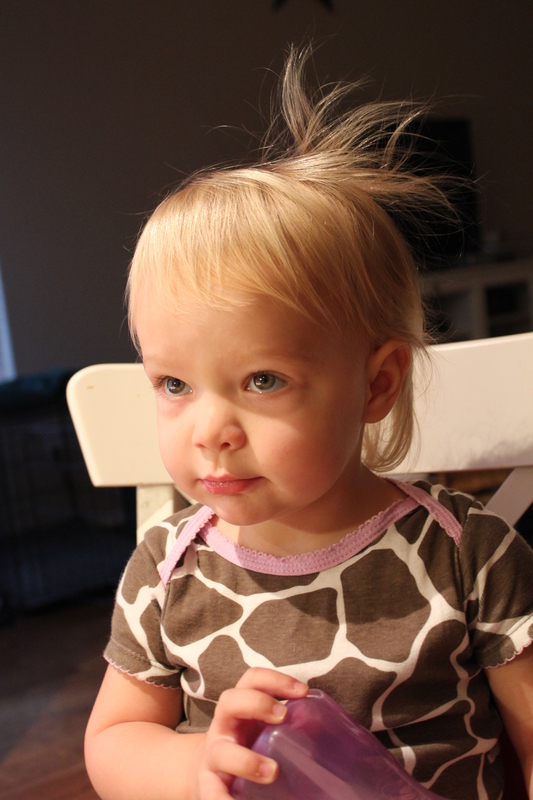 The morning started with a serious case of bed head. Brett made us French toast for breakfast, we addressed the wacky hair and we gathered the supplies. Now on to the front porch for pictures! I had a cute idea of her standing with a sign, this didn’t play out into reality. The idea of standing still and smiling at the camera didn’t play out into reality. But this is pretty darn close. 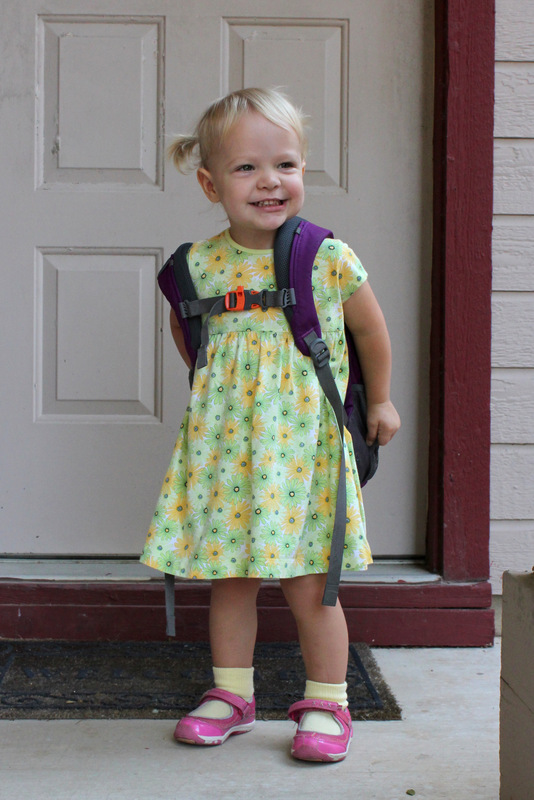 When we dropped her off, she was pushing on the classroom door to get in – very enthusiastic! She said goodbye easily (as normal) and we were on our way. Now, what to do with the next five hours… I cleaned, did some laundry and had a lunch date with Brett. 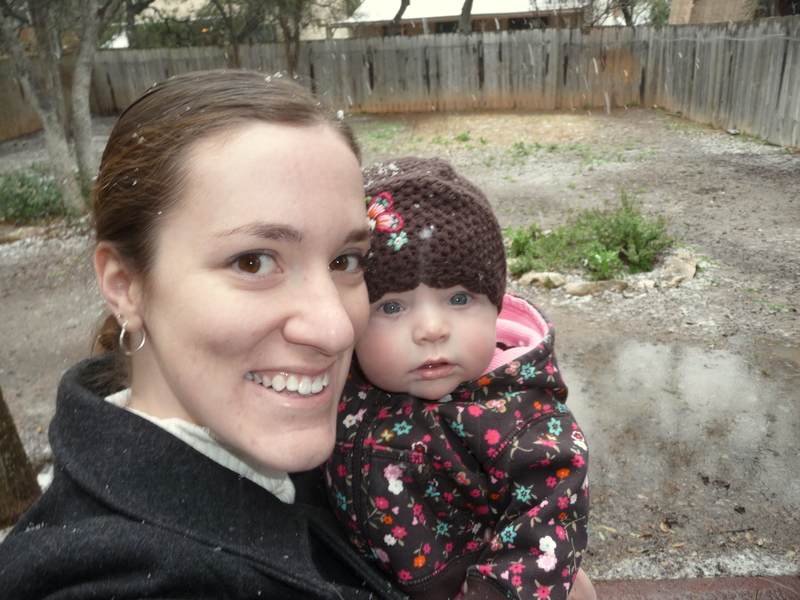 According to the schedule, Hannah had playtime, Bible story time, went outside, and had pizza for lunch. Her teachers said that nap time was rough; she was so tired that she just cried and asked for mommy. Hopefully, she’ll get used to the schedule and take advantage of nap time in the future. Tonight, Brett asked, “What did you learn about today?” and to our surprise Hannah promptly answered, “Jesus.” I think we’re off to a good start! Another delicious recipe from my mom, Joyce. 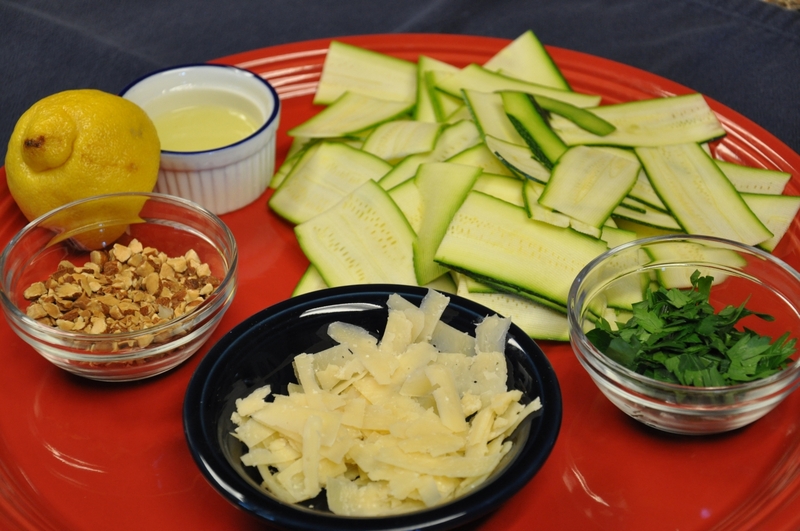 I am not a fan of raw zucchini, but this sounds so good I’m definitely going to give it a try. 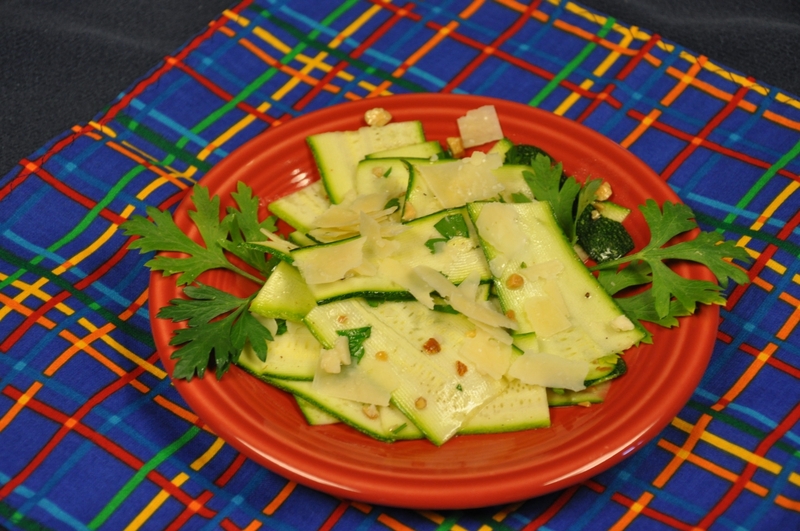 Raw zucchini salad? You are probably thinking about those oversized zucchini rounds on the grocery store salad bar. Put aside those spongy seedy discs and check this out! The chef/instructor at a cooking class recently prepared this recipe, and we all became converts. The recipe uses a base of ingredients that I almost always have in my kitchen, and variations are listed below. 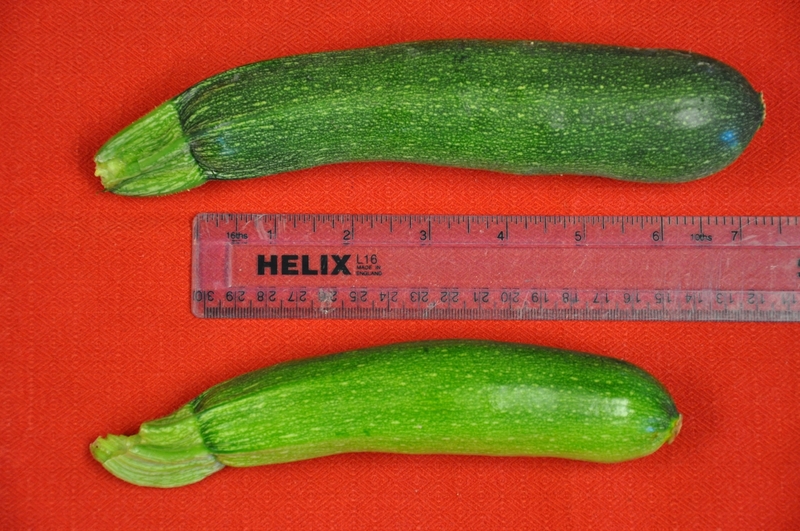 Note – This is NOT a way to utilize monster zucchini. They have thick skins, huge seedy areas and a spongy texture, unlike the smaller version. Using a mandoline slicer (and being very very careful), slice the zucchini thinly lengthwise (less than 1/16th inch thick, if possible). Place in a large bowl with 2/3 of the shaved Parmesan, plus the almonds and the parsley. Season with salt and freshly ground pepper. Drizzle 2 T of lemon juice over. Toss and add more lemon and salt as necessary. Add 2 T of olive oil and toss again. Taste and correct the seasoning. The salad should be a bit on the tangy side. Divide the salad among serving plates and drizzle each serving with a bit more olive oil. Garnish with additional parsley leaves and the reserved Parmesan.